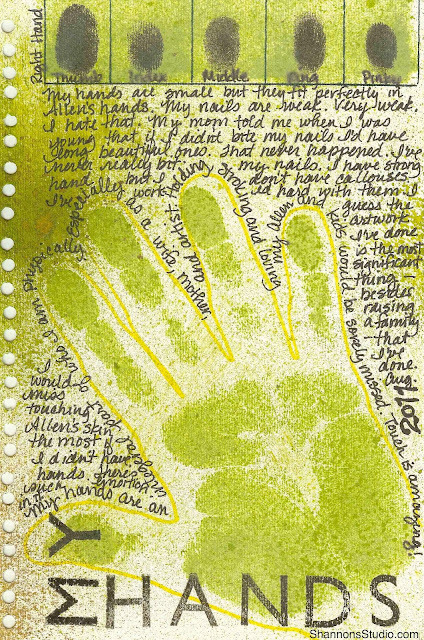 Here's my art journal page for last week's theme - My Hands. I know. I like green. I'll mix it up another day and do other colors. But, for now this is what I wanted to do. • Used a green stamp pad for my handprint. • Traced my hand with a yellow crayola marker. • Ink pad the bar at the top. • Black inked my fingerprints. • Sprayed green watered down paint. • Black ink stamped letters at the bottom. I hope you recorded some of your thoughts this week. I'm pleased that I'm finally doing some record keeping about myself. Celebrate Me is making me think about it. I'm already thinking about what I want to record for our next one.